How Fast Would the Economy Need to Grow in Order to Close the Deficit? Jason Fichtner and Veronique de Rugy in a recent Mercatus Center publication argue that absent any fiscal reforms at the federal level, the United States would need unprecedented economic growth to close the deficit. “This week’s charts use data from the Congressional Budget Office to highlight the US fiscal position over the next ten years. 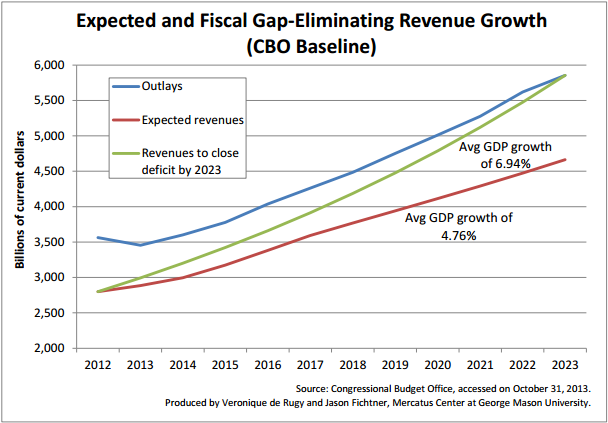 These charts display projected outlays and revenues under the CBO baseline scenario and alternative baseline scenario, along with the revenues needed to eliminate the fiscal gap over the next decade and the average GDP growth rates needed to generate each revenue line. “The first chart displays outlays and revenues under the CBO baseline scenario. The CBO’s projected outlays are plotted along with expected revenues, which are calculated as the historical average of 18 percent of projected GDP. Keeping in mind that GDP projections are typically optimistic, the chart shows that the United States will maintain a considerable fiscal gap over the next ten years, even with a projected nominal average growth rate of 4.76 percent. 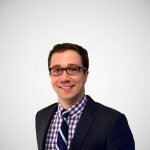 Based on their calculations, it is not reasonable to assume that the United States will be able to grow out of its current fiscal problem if policy remains the same. The United States’ is in need of both entitlement reform and tax reform. And if we structure tax reform to grow the economy and thus tax revenues, entitlement reform could be easier.